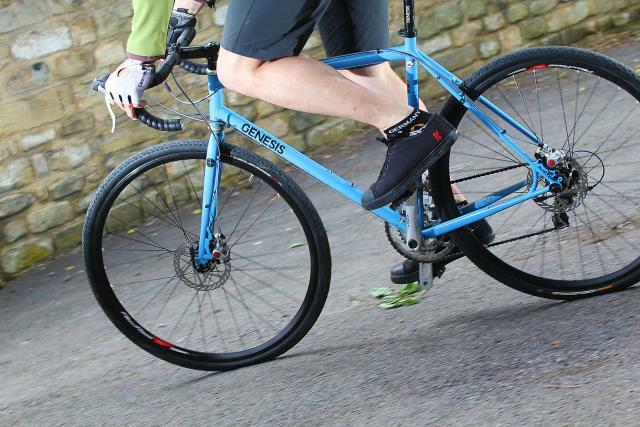 A budget kid brother to Genesis' popular steel road all-rounder, the Genesis CdF is a solid urban and light-touring ride, as long as you're not in a hurry to get from A to B. The Genesis Croix de Fer has a good reputation; it was even used to set a world record when Vin Cox rode a Croix de Fer around the world. Genesis say the Croix de Fer is one of their most popular bikes, so they decided to introduce a little brother: the CdF. 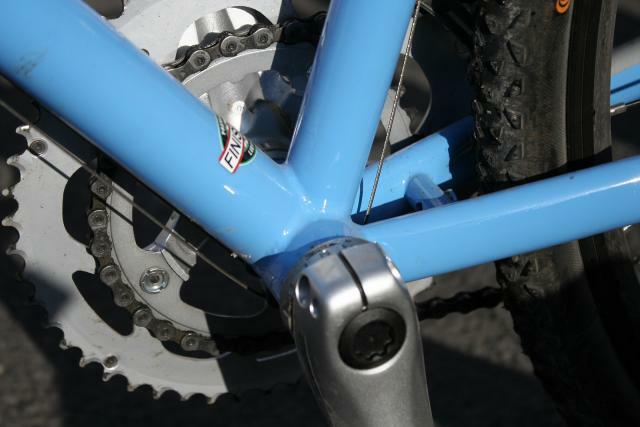 The frame has the same dimensions, but is made from Reynolds 520, as opposed to the Croix de Fer's 725. Genesis say this strategy - using the same geometry and the same material, albeit a different grade - has "retained the handling and ride quality their steel framed cross style bikes have become known for". When I first picked the CdF up from road.cc HQ, I was expecting a steel framed racer with clearance for bigger tyres and disc brakes. I was disappointed - the CdF will not set any PB's; that's not its style. Riding it a bit more though, I discovered that if you put the racing thing to one side, it's a really nice ride. As much as the comfort and springiness of steel is a cliche, that is the ride experience. That steel-feel makes the bike a great commuter or light-tourer. The frame isolates you from most of the road buzz, and handling is solid, though certainly not the most lively I've ridden. There are braze-ons for mudguards, two bottle cages and a front and rear rack, as well as for a bolt-on front mudflap on the downtube. While that's great, you'll need to choose your pannier rack carefully to make sure it doesn't foul the disc brake caliper which is seat-stay mounted rather than a more rack friendly chain stay mounting. I managed to fit a Tortec Ultralite rack with just a couple of washers to space it out a little on the caliper side. There's eyelets for mudguards too if you want to fit them. I didn't - because there isn't enough clearance between the fork crown and the 35mm Continental Cyclocross Race tyres for a comfortable fit. The choice of Reynolds 520 chromoly means the CdF is no lightweight. Unfortunately this is exacerbated by a distinct lack of suitable gears to get up hills. 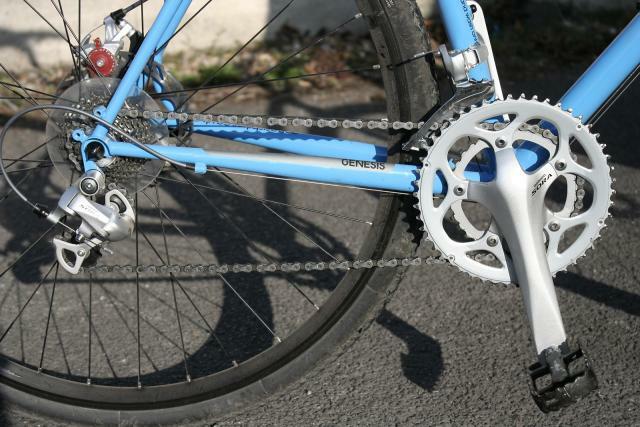 The 34 x 25 bottom gear is provided by a Shimano Sora compact chainset, shifters and front and rear mechs. This may well be low enough to get up hills on a lighter and racier bike but, unless you like a battle, it isn't low enough for the CdF. Even when I swapped the chainset out for a triple (resulting in a 30x25 bottom gear) I could have done with lower gears at times. Shimano Sora 9-speed is functional, but doesn't give the same buttery smooth shifting feel you get from the new 10-speed Tiagra. While the hood grip ergonomics feel less Spartan than 8-speed Sora, comfort is not in the same league as the more expensive units. I also didn't really get on with the thumb downshift. The lever is a bit small, and can't be reached from the drops, unless your hands are as big as our Dave's. Braking is courtesy of Avid's BB5. It's a cheaper version of the BB7, which has a reputation for being the best mechanical brake on the market. The BB5s work really well too, though you get more adjustability and bigger brake pads from BB7s - and a bit more braking power. 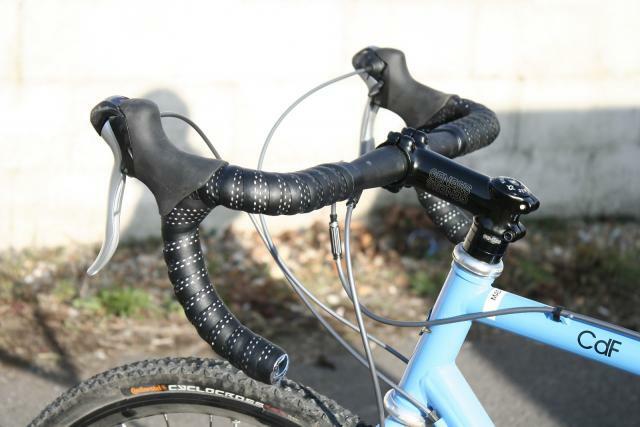 Handlebars, stem and seatpost are Genesis own brand and do the job just fine. I quite like the handlebar shape; the drop is shallow enough to actually spend some time there. The saddle is also Genesis own brand. I didn't get on with it, but that's no biggie; saddles are a personal thing. The wheels, though a bit on the heavy side, are comfortable and sturdy, and they stayed true throughout testing. The Continental Cyclocross race tyres work surprisingly well on the road and on really shift on dry towpath and singletrack. You'll probably want something a bit knobblier for proper mud though. All in all, it's a good all-rounder as long as you don't expect to get there first. This is what Genesis say: "Following the popularity of the Original Croix de Fer, we introduce the CdF. Using the same geometry as its sibling it combines a Reynolds 520 tubeset and Cr-Mo fork, retaining the handling and ride quality that our steel framed cross-style bikes have become known for. The Cross bikes have become our most popular export. As popular in Scandinavian countries as it is in the UK - it's a road bike that won't get bogged down in the winter, can join in on summer singletrack rides and copes with all-weather cross-terrain riding in a way that few bikes can match. With improved, wider, separate rack eyelets its perfect for lightweight touring. The drive is reliably provided by Shimano 9 speed components, whilst Avid BB5 Disc brakes give responsive braking in any weather. This is simply a cross-boundaries, cross-continent, cross-inspired kind of bike. 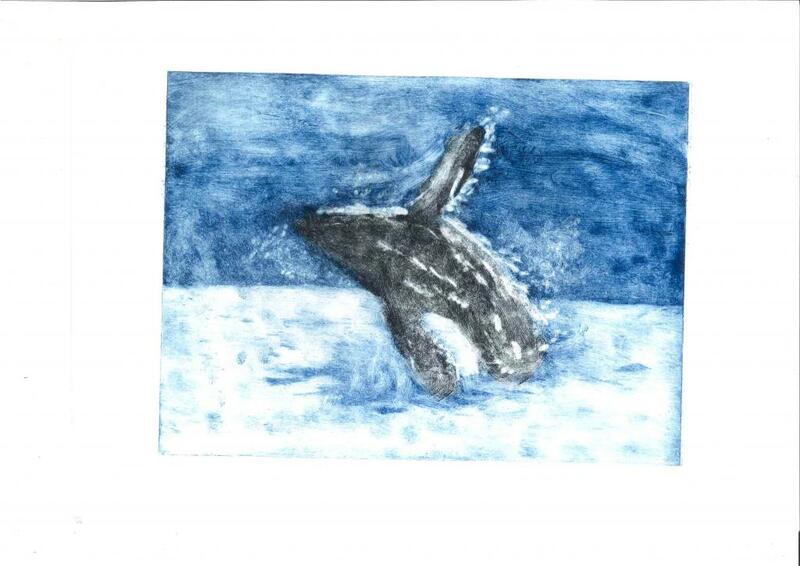 Wherever you find yourself, there's fun to be had." The CdF uses the same geometry as the Croix de Fer, but the steel is not as fancy, making the frameset heavier. It is a good bike for all-day riding, but it's not a cyclo-cross racing bike. It doesn't look it was designed for the latter anyway, as there is hardly any clearance between the fork crown and the 700x35 Continental Cyclocross Race tyres. The frame and fork look well put together; the finish has stood up to muddy lanes in very wet weather commuting. The CdF frame is made from Reynolds 520 steel, as opposed to its more expensive sibling, the Croix de Fer, which is welded together from Reynolds 725. The fork is made from non-specific Cr-Mo. While the geometry is, on paper, very similar to a proper cyclocrosser, the bike feels much more like a tourer. For me this fits with the "do anything" badge Genesis have given it. Height and reach were fine on the 56cm model tested; it felt really quite comfortable. The bike is very comfortable as long as you're not trying to get up any steep hills, when the lack of suitable gears puts a downer on things. Considering that this is not a racing bike, it's stiff enough to do what it is designed for: all day in the saddle with or without a (modest amount of) luggage. Considering the weight and cyclocross tyres, efficiency's really not too shabby - for a (relatively) lightweight tourer. There is a small amount of overlap. I didn't find it a problem. How would you describe the steering? Was it lively, neutral or unresponsive? Steering is pretty neutral. It handles just like a decent touring bike, which is not a surprise given that it's made from the same material and has almost the same geometry (on paper) as my touring bike. The handling is solid; don't expect any surprises either way. I didn't get on with the saddle, and swapped it for something my shape after the first ride. I'm not a big fan of the Sora style downshift. If you're planning to mainly ride on the road, I'd go for a road-specific tyre. I wouldn't swap out anything to change the bike's stiffness. If you wanted a more lively ride, a lighter wheelset would make a difference. Having said that, if you're after a lively ride, you're probably better off looking elsewhere. Power transfer is OK for a touring bike. The bike is a bit too heavy to do much quick accelerating. You'll need something else to be quick off the lights. Cruising is what it's good at. It needs a whole other set of gears to be any good at climbing. Like a triple AND a bigger cassette. This bike is seriously overgeared. A compact chainset with a 12-25 cassette is nowhere near low enough for my commute, which admittedly is pretty hilly. This bike would benefit from mountain bike gearing in my opinion, especially if you're carrying stuff. While not lightweights, the wheels were absolutely fine and stayed true throughout. The tyres worked surprisingly well on the road. I don't like the Sora style downshift. My hands are too small to be able to shift down from the drops. Or is the thumbshifter too far away? Did you enjoy riding the bike? I did on the flat, but not up hills. And I love riding up hills. Would you recommend the bike to a friend? Not unless they lived somewhere flat and didn't mind the weight. It's too heavy to be a cyclocrosser. While the frame has the makings of a good tourer, it will need lower gears to be ridden comfortably anywhere that is not flat. The rack and mudguards don't have to share the same bosses, there are completely separate bosses for each. I would have liked to see this review consider the angle of swapping out the tyres for something racier - say as set of 25C Gatorskins. That's a relatively inexpensive and easy change that anyone could make, and seeing as pretty-much every negative in this review *could* have been due to the CX tyres fitted, it would have been interesting to see that theory tested. adding to the points made above, i really believe the hoods are down to preference. i love the sora with the thumb shift. but, at 799.99 though there are a lot of bikes out there that are steel/ are not steel, but still give a great ride , and cheaper than this. If anyone thinks that a 34-25 isn't low enough to get up hills. Well, you know what I'd think about that. yup, that's one of them there mistakes. i've amended the copy. I think the point really is: why would you spec an 11-25 on a bike of this nature when you could have specced an 11-28? it doesn't really make any sense to limit the range of gears. IMO, 11-28 is the perfect cassette. Straight block up to 16, then BAM, some climbing sprockets. I have a Salsa Vaya, which runs with SRAM Apex compact and 32T cassette. I like that 32. It doesn't get used all the time, but it's there. And when you're lugging a heavy bike with a bag on it up a steep hill at the end of the day that's a good thing to know. Have I got this right - this bike is called the CdF & is the cheaper sibling of the Croix de Fer? Up until two weeks ago I would have agreed with you; but I've just got back from a week in Alpe D'Huez & after two days I bought a 11-28 to go with my compact front ring. those extra couple of teeth made all the difference & got me up the Alpe in under an hour. I think the 11-28 will be staying! Haven't really had a chance to have a proper go on it yet, but brief experience suggests that one could do serious miles on it in some comfort. 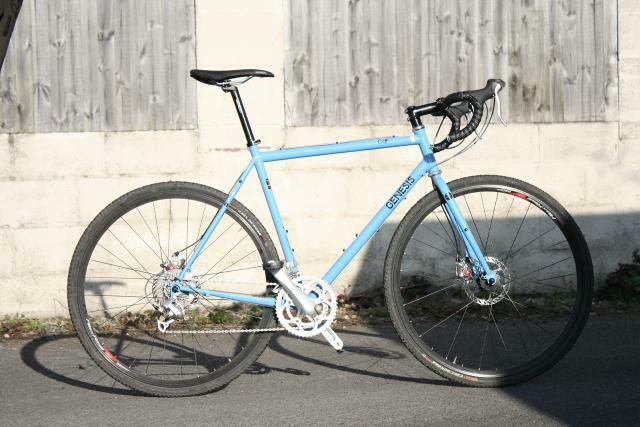 I ride the original full fat Croix de Fer as my one and only bike. Had it 18 months now. I also changed my rear set to 11-28 (as a newbie I was frightened of doing the Road.cc Sunday Munch over Malvern last year). All in all it's ace. I run gatorskins when I need to be speedy on the road (Flanders 140km sportive this year) and the CX speed kings for everything else (including completing the South Downs Way). I've also had it set up with full panniers for touring, hacked about through town on it and rode the novice race at Muddy Hell last autumn. Honestly, it's flipping great for someone like me who rides whatever is in front of him rather than aligning to a particular tribe. Only two things left to do on it, actually ride up the Croix de Fer and I'm intending to ride across the USA. Both things well within the bikes capability (though not mine without a stack of training). Looking at the compromises mentioned with gears etc I'd say save your pennies and get the original. It's speedier than it looks and stable in all kinds of scary conditions, cobbles included! @slow-cyclo: I think that sums up the Croix de Fer perfectly: "someone who rides whatever is in front of him rather than aligning to a particular tribe". That's why I bought mine earlier this year and it's been ideal: a week's touring, Sustrans routes, Hell of the North Cotswolds, weekend spins or an after-work blast up the local byways... it copes with them all. Worth noting that the 2012 Croix de Fer has a 12-28 as standard - I just went and counted the full 28 to check. Just thinking though... shouldn't this review have gone up a day later for full TdF tie-in goodness? I'll wait until 2013, when the Sora shifter will be replaced with what looks suspiciously like the old nine speed Tiagra shifters and which don't have the stupid, STUPID thumb levers. Sorry I really can't stand the Sora levers. You are right, my mistake! Admittedly, I didn't fit mudguards because of the fork crown clearance issue. That is something that I could have tried, however, as I tried to make clear in the review, trying to make the CdF is somehow missing the point of the nature of this bike - in my opinion. It will not reward you for trying to go quickly on it, it will reward you for enjoying a ride for what it is. Because the weather was so foul during the test period, I was actually really glad to have the cx tyres. I commute on lanes and they saved them on quite a few muddy patches. It's also worth noting that the inner rim width is 17.1mm (from the Alex website), compared to 15mm for a Mavic Open Pro, is a bit wide for a 25. I would personally not go smaller than 28. I used to think that. Then I changed jobs and started commuting on lanes. It's not that I can't get up hills on 34-25. It's just that I spend less energy if I spin, and can keep riding for more days of the week. I ride a Kinesis Crosslight Pro6 with a 34-30 bottom gear. I'm thinking I'll probably go up to 34-34 for the winter. The Crosslight Pro6 is similar to the CdF in that it has disc brakes and take big rubber. It is different in that it has proper cx race geometry, takes BIG rubber (37 + 'guards easy) and the frame is as light as, say, a Ribble Audax frame. In terms of gearing the, main difference between the two is that standing up on the pedals on the Crosslight is a pleasant experience that gets you somewhere, whereas you're much better of spinning on the CdF. It would have been interesting to have compared the CdF and the 'big brother' Croix de Fer in the same review by the same person. Otherwise it's difficult to get an idea of exactly what the diffs are, except for the weight. Not that I can find any figures for the actual weight of either in the review. I look forward to it. Looks like mine will be getting its first proper outing (on Durano Plus 700x32s - the stock Continental CX tyres are too noisy and squirmy on the road) this weekend. Coming from an MTB background I was looking for something I could use in the winter for both road and single track. Steel frame was a must for comfort and I wasn't concerned about the weight of the bike. My first ride out was a 26 miler of single track, Bridlepaths and road. What impressed me most was how it climbs on single track, previously I was in the granny ring (22T and 32T on the rear for my MTB HT and got up on the CDF on the standard low gears (34T front 25T rear) I did have to get out of the saddle on some parts though. It's great fun and comes into it's own on single track but fun in a different way to an MTB bike. I guess if it's used solely for road then you could be disapointed but then that's not what it's for. I have already changed the seat post and saddle which were at best average. I've added lighter pedals and will probably change the rear cassette to a 28 which will cost about £20 off the internet. Why Genesis did'nt put a 28 on is a mystery as it's on the more expenive version? Genisis inform me ( via twitter ) that they plan to put an 11-30 casette on next years model.